WASHINGTON DC June 12, 2015– Democratic members of Congress today united themselves against President Barack Obama and wealthy corporate interests by defeating a trade deal that would have been disastrous for American jobs. Labor unions– unified with environmental groups, farm groups and human rights organizations– have been demanding for months the defeat of Fast Track trade legislation, which would have lead to the passage of the Trans-Pacific Partnership, and the loss of thousands of American jobs to Asian countries. The House on Friday dealt a staggering blow to President Barack Obama’s trade agenda, as Democrats turned en masse against the president just hours after he made a direct appeal to salvage a centerpiece of his second-term platform. Lawmakers easily defeated a measure to help workers displaced by free trade known as Trade Adjustment Assistance. The aid package needed to pass in order to enact companion legislation that would give Obama fast-track trade authority to complete the sweeping, 12-nation Trans-Pacific Partnership trade pact. The vote on the TAA bill was 126-302. The vote came after President Barack Obama, in a last-ditch effort, made a rare visit to the Capitol to lobby for legislation. He implored Democrats to “play it straight” on the decisive vote. After TAA failed, the House approved fast-track legislation, known as Trade Promotion Authority, in a 219-211 vote. But that vote was largely for show, because enactment of TPA is contingent on approval of TAA. The House could vote again on TAA next week. If enough votes flipped to pass it, it would mean that TPA prevailed as well, because the two bills are interconnected. House Republican leaders say they have 100 votes for TAA, and Democrats would need to provide 118 if another vote happens. On Friday, Democrats provided 40 votes for TAA, while 86 Republicans supported it. In other words, Democrats would need to essentially triple their vote total to pass the measure. The west Michigan labor community applauds Rep. Amash for listening to the concerns of his constituents, boldly going against the wishes of his party leadership, and doing what’s right for Michigan’s middle class families. “The House of Representatives has done the right thing, but the fight isn’t over. “This is a significant day. American workers came together and spoke with one voice about the path their country and economy should follow. 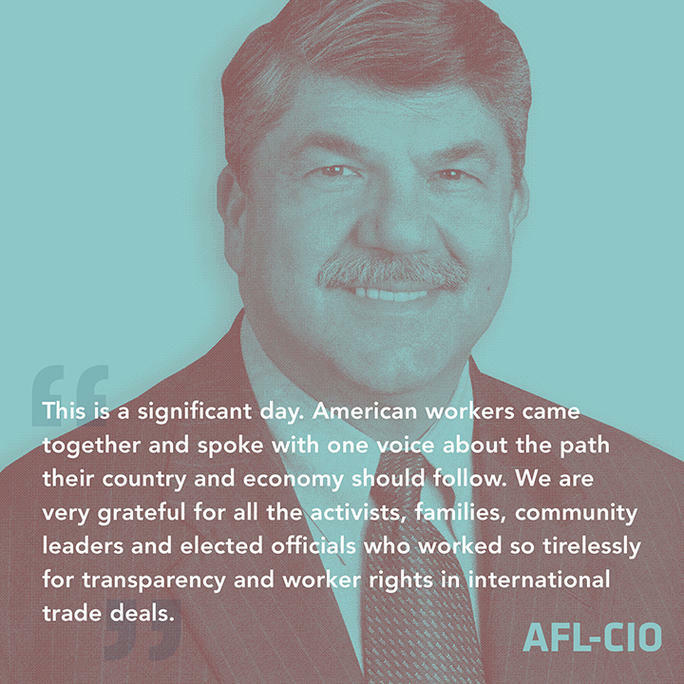 We are very grateful for all the activists, families, community leaders, and elected officials who worked so tirelessly for transparency and worker rights in international trade deals. “The debate over Fast Track so far has been a marvelous contrast to the corporate money and disillusionment that normally mark American politics today. This was truly democracy in action – millions of people exercising their free rights to inform their elected representatives. We should all draw from this experience to help replenish our democracy at every level on every issue. This entry was posted on June 12, 2015 by WMALC in Political news and tagged Barack Obama, Bill Huizenga, Democrats, Fred Upton, Justin Amash, Nancy Pelosi, Republicans, trade.